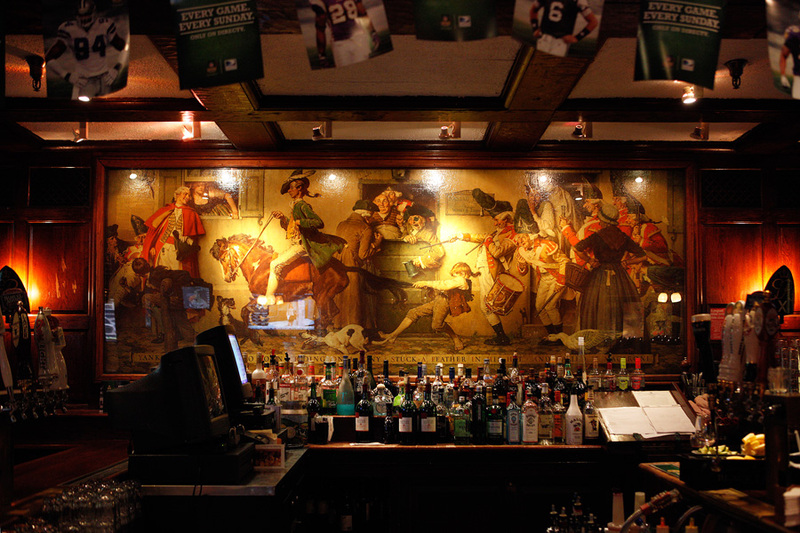 The impressive work of art behind the bar in The Yankee Doodle Taproom of the Nassau Inn at 10 Palmer Square is an original Norman Rockwell painting. The cozy and comfortable bar is the namesake of the work. The Nassau Inn was originally located at 52 Nassau Street and was the residence of Judge Thomas Leonard, a founder of the college now known as Princeton University. When Leonard died, the building became an inn under the auspices of Christopher Beekman, its first proprietor. Paul Revere, Robert Morris and Thomas Paine were guests at the inn, a mainstay along the route of the Founding Fathers' revolutionary journeys. In 1937, "Old Nass" closed its doors and a larger, more suitable hotel was constructed on Palmer Square. That same year, at the peak of his career as an illustrator, Norman Rockwell was commissioned for the whimsical, 13-foot wide painting known as "The Yankee Doodle" for $2,500.00. The painting sat open to the bar for many years and is now wisely behind glass. Veteran bartender Tony Pirone - the soul of the Yankee Doodle Taproom! - tells us the painting is now insured for $6 million.